Did God really cause those hemorrhoids? 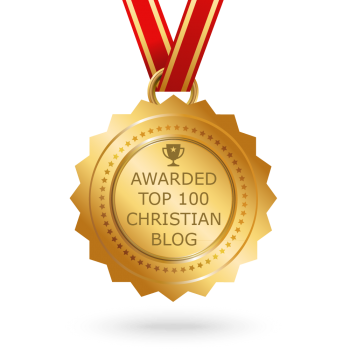 11 November 2018 - 11 November 2018 - by Ray Hermann, D.Min. The first mention of hemorrhoids is in the fifth book of the Bible, Deuteronomy (meaning ‘second law’), which contains three speeches by Moses lecturing the Israelites before they entered the Promised Land. He was reminding them of the need to follow God’s laws, upon which their possession of the land depends. In chapter 28, are listed the curses that will befall those who break the law.4 These curses mentioned afflictions which reminded the new generation of the experiences of their parents in Egypt.5 It is one of these curses that first mentions hemorrhoids. 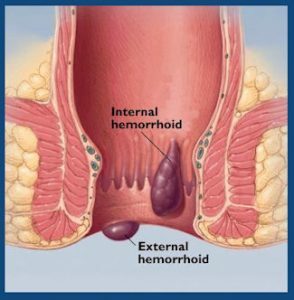 There are other references to hemorrhoids, but most appear in the first book of Samuel, when God actually imposed this curse upon a population as punishment. “The victims were the Philistines—the longtime enemies of ancient Israel—who were living in a region called Ashdod.”7 Here is the story. After losing a battle with the Philistines, Israel’s army regrouped and could not think of a reason God did not allow them to win. Although the Philistines were always the aggressors in war, Israel’s army was partly at fault. “They did not discern, in the great and general corruption of religion and morals . . . the reason why the presence and aid of God were not extended to them.”8 The men recalled how the Ark of the Covenant had accompanied Israel’s army to capture the city of Jericho (see Joshua 6); the men concluded that the Ark would surely guarantee victory over the Philistines, too. At this time, Eli was the high priest and he had two wicked sons, Hophni and Phinehas; their names meant “tadpole” and “dark-skinned one”9 in Egyptian. They served as officiating priests in Shiloh (1 Samuel 1:3) and abused their priestly privileges. 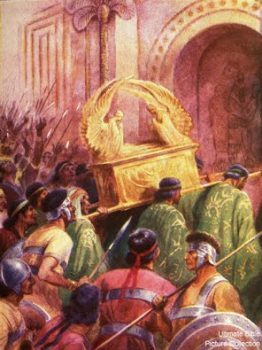 “They intimidated sacrificers into giving them meat for their own use (1 Samuel 2:12–17), and took sexual advantage of the women who worked at the entrance to the tabernacle (1 Samuel 2:22).”10 It was Eli’s two sons who delivered the Ark to the battlefield. Before, at Jericho, the Ark was present in battle by direction of almighty God, but this time it was being brought into battle only by direction of mere men. You can see where this is going. Yes, the Philistines not only won the battle, but killed Eli’s sons and captured the Ark, too. They brought it to the coastal city of Ashdod and placed it in the temple beside their own god, Dagon. 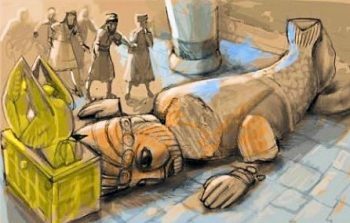 “To the Philistines, the Israelites’ defeat meant that Dagon was more powerful than the LORD.”13 But, the first night in the temple a curious thing happens, the statue of Dagon fell over. The next day they stood the statue upright and then, during the second night, it fell again, but that time Dagon’s head and hands were broken off. It’s as if the God of the Israelites was showing that Dagon was a lessor god and made him bow before the Ark. Meanwhile, the people of Ashdod were also struck with various physical afflictions, including hemorrhoids. It appears, also, that their fields of crops also became infested with mice and were destroyed. Coincidence? No, but that was one consideration the Philistines had. 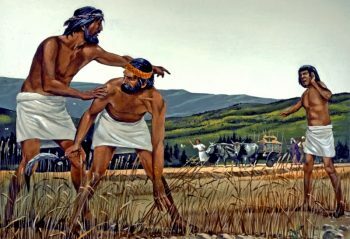 Another interesting bit of information, found in the Jewish Radak,15 explains that the affliction was doled out to the Philistines who, while relieving themselves, would suffer from mice biting the bleeding hemorrhoids.16 Anyway, whether that thought is correct or not, the Palestinians believed taking the Ark may have brought God’s anger (which it did) and their punishment was mice and hemorrhoids (which it was). 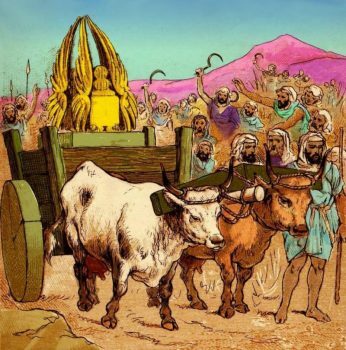 After the people and leaders decided the Ark of God should leave their city, it was sent to Gath. The same thing happened. And then it was sent to Ekron, where the afflictions were reproduced again. Everywhere it was sent, tragedy followed. After putting up with this calamity for seven difficult months, the rulers of the area’s five cities decided that, just maybe, the problems weren’t coincidental. Maybe the Ark should be returned to the Israelites. “Then the Philistines called in their priests and diviners and asked them, ‘What should we do about the Ark of the LORD? Tell us how to return it to its own country.’ ‘Send the Ark of the God of Israel back with a gift,’ they were told. ‘Send a guilt offering so the plague will stop. Then, if you are healed, you will know it was his hand that caused the plague’” (1 Samuel 6:2-3, NLT). They asked what sort of guilt offering they should send and the priests and diviners said that because the problems affected all five cities, they should craft five gold hemorrhoids and five gold mice. Yes, you read that correctly, they were to make five hemorrhoids and five mice in solid gold. They said these things would show honor to the God of the Israelites and he would stop afflicting the Philistine people, their god, and their land. So, that is what they did. 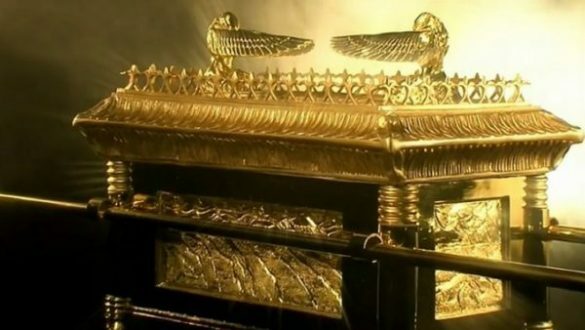 They devised a method to return it and determine, once and for all, if the problems were only by coincidence, or if they were caused by having this Ark of God in their possession. They obviously didn’t want to give this treasure back, if they didn’t have to do so. The gold hemorrhoids and mice were put into a chest and placed upon a cart along with the Ark. To pull the cart, two milk cows, that were never yoked before, were selected and their calves were separated away from them. The Israelites were harvesting wheat in the valley of Beth Shemesh, so that is the direction in which the cart was directed. Cows separated from their young and yoked to a cart—although never yoked before—would, by logic, not perform as was the intention. It was reasonable to assume the cows would revolt and try to get to their calves. The Philistines’ reasoned that if the Ark actually arrived where it was directed, then it would be by an act of the God of the Israelites. “And sure enough, without veering off in other directions, the cows went straight along the road toward Beth-shemesh, lowing17 as they went” (1 Samuel 6:12, NLT). You can read about this confrontation between the Israelites and the Philistines in the Old Testament book of 1 Samuel, chapters 4 through 6. It gives great details about the savage battles, the capture of the ark, and its return after causing such misery to the enemy. All this leads into the leadership of Samuel, the last of the judges, when the Israelites return to God’s favor and the Philistine army is repelled with God’s help. → Leave comments at the end, after References & Notes. OBS respects your privacy and is also compliant with the European Union GDPR regulation. Click here to read. Gilbrant, Thoralf, (ed. ), The Old Testament Study Bible: Deuteronomy, (Springfield, MO: World Library Press Inc., 1996), p. 289. Peterson, Eugene H., The Message, The Bible in Contemporary Language, (Colorado Springs: NavPress Publishing Group, 2002). Kovacs, Joe, Shocked by the Bible, (Nashville, TN: Thomas Nelson, 2008), p. 88. Jamieson, Robert, et al., Commentary Critical and Explanatory on the Whole Bible, (Oak Harbor, WA: Logos Research Systems, Inc., 1997, [original copyright 1871]), vol. 1, pp. 177.
van der Toorn, Karel, et al., (ed. ), Dictionary of Deities and Demons in the Bible, (Grand Rapids, MI: Wm. Eerdmans Publishing Company, 1999), p. 216. Achtemeier, Paul J., (ed. ), Harper Bible Dictionary, (San Francisco, Harper & Row, Publishers, 1985), p. 202. Elwell, Walter A., (ed. ), Evangelical Commentary on the Bible, (Grand Rapids, MI: Baker Book House, 1989), vol. 3, p. 1976. Radak: Commentary by medieval scholar Rabbi David Kimhi (1160-1235 AD), also known by the acronym RaDaK. lowing: to utter the deep, low sound characteristic of cattle; moo. A few questions about Christmas – and what is it with all that glitter? They said, “This woman was caught in the act of adultery.” Then Jesus stooped down and wrote in the dust with his finger. All I can say is “wow ” I never knew. Thank you for reading the article and I am glad you enjoyed it. There are a lot mysteries in the Bible; all it takes is a deeper study to find the answers.